Sebald's Leucas is a rare straggling perennial herb 1-1.5 m long, basal stem 1-1.5 cm thick, woody; branched round, bristly with 1-1.5 mm long golden brown hairs, tender stem densely hairy. 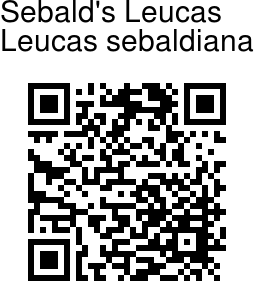 It is named after Dr. Oskar Sebald, in appreciation of his contribution to the genus Leucas. Leaves are borne opposite, decussate, ovate to lanceshaped, 3-8 x 3-5.5 cm, almost two times longer than broad, somewhat pointed, sometimes blunt, base rounded to blunt, margin sawtoothedd with 15-19 teeth, secondary veins 5-7, prominent beneath, lower surface hairy, especially on the veins, upper glandular punctuate, rugose on fresh specimen, bristly, hairs 1-1.7 mm long; leaf-stalk 1-2 cm long, bristly. 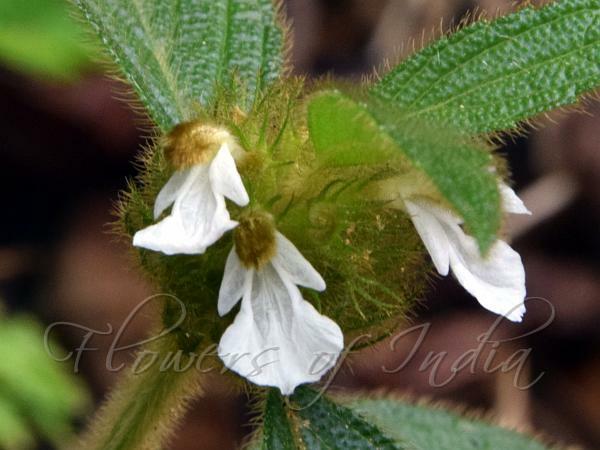 Flowers are borne at branch-ends, in a solitary verticillaster subtended by a pair of leaves, 2.5-3.5 cm across, nearly spherical with uneven margin due to the varied length and divergent nature of the flowers, dense many-flowered. Flowers are 15-25, flower-stalk 1 mm long. Calyx tubular, size varying, 1.5-2 cm long, narrowed and hairless towards the base, slightly bulged and dense long bristly in the middle, upper half tubular, forwardly bent, short bristly, netveined and longitudinally ribbed, hairs projecting outside the mouth giving a fringed with hairs appearance, veins forming a thick annulus at the mouth; teeth 10, straight, nearly equal, 3-4 mm long, long subulate with triangular base and tapering tip, outside and margin of the teeth bristly with spinulose hairs ; fruiting calyx more bulged in the middle. Flowers are 2.2-2.4 cm long, tube 1.0-1.1 cm long, slightly bent and fully included in the calyx, annulate around the middle inside with a ring of fleshy hairs; lower lip white, 1.0-1.3 cm long, middle lobe fan shaped and 8-9 mm broad, side lobes small, 2 mm wide at the free end, margins slightly curled, tips asymmetrically notched ; upper lip yellowish brown, 5-6 mm long, rounded and concave with hairs in all directions. Stamens do not protrude out. Sebald's Leucas is found in Southern Western Ghats. Identification credit: S. Kasim Photographed in Wagaman, Kerala.